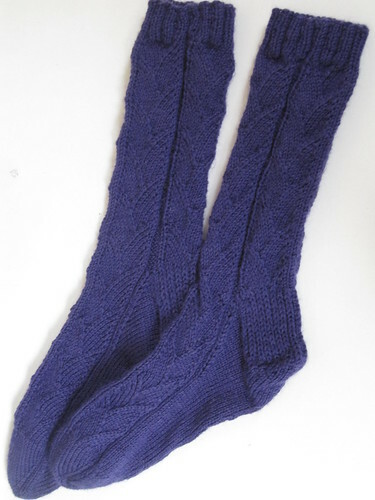 I finished my first installment of my Self-Imposed Sock Club (SISC) on Monday, wove in the ends and blocked them. Ta da! Comments/mods: This was a nice pattern - enough to keep me moving on it (aka not bored silly), but an easy stitch pattern to memorize. I made one modification on the toe - I continued the purl ridge down the sides of the toe, just because I liked the continuity. 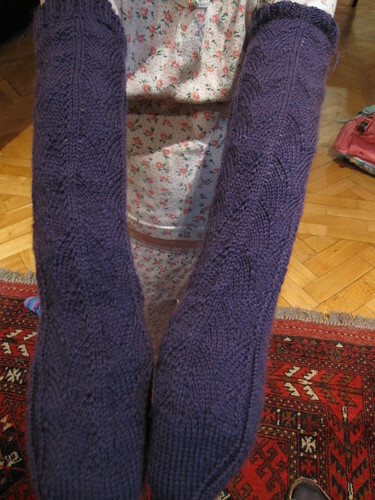 I knit these just as written (60 stitch sock) and, as a result, they are waaaaay too small to fit me. I wanted a modelled shot, but Boo's arms were as close as I could get. At least you can see the stitch pattern a bit better...these will go to some deserving soul with more petite feet. In an unbelievable, once-in-a-lifetime convergence, I actually finished two pairs of socks this month. These are for Boo, toe up, no pattern to speak of, short-row heel, an inch of 2x2 ribbing, find right spot in ball, repeat for matching stripes. 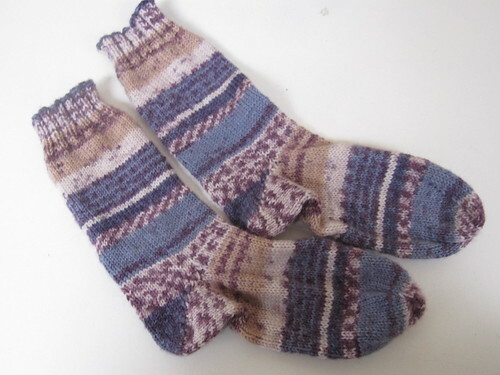 I started these on our three-day trip to Copenhagen just after Christmas, and finished them a couple of weeks ago? I think? Anyway...Month 1, two pairs. It can only go downhill from here! Written by porpoise On January 27, 2011 In "11in2011", "Boo", "FO", "SAM", "socks"